Sorry for the delay with this entry, but the NBA playoffs are now underway. After a wild condensed schedule, the lockout shortened regular season is now in the books and we have a fun month and a half of playoffs hoops leading up the NBA Finals that start June 12. After the tough season a few teams are pretty banged up and there are a few stars who will not be participating in this year’s tournament, but there is plenty for basketball fans to be excited for. Without further ado, here are the standings from the regular season along with the playoff matches and my predictions for the first round. #1 Chicago Bulls vs. #8 Philadelphia 76ers: During the regular season series between these two teams the Bulls took two of of three from the Sixers. The Bulls were the most dominant team in the Eastern Conference and were one of only two teams to win 50 games in this lockout shortened season (finishing 50-16, good for a .758 winning percentage). Had I written this entry yesterday I probably would have had the Bulls winning the conference, but during yesterday’s game their point guard and by far the best player on the team, Derrick Rose, tore his left ACL coming to a jump-stop in the final minutes of the game. It was a gruesome, non-contact, injury that could change the entire dynamic of the Eastern Conference playoffs but I still believe that the Bulls and the disciplined team defense that they play as ordered by head coach Tom Thibodeau should be enough to get them by Philadelphia. For the Sixers to pull the upset Elton Brand will need to be a force in the post, and young guards Jrue Holiday, Thaddeus Young and Evan Turner will need to step up and help veteran swigman Andre Iguodala with his matchup against the Bulls’ Luol Deng. My prediction: Bulls in Six. 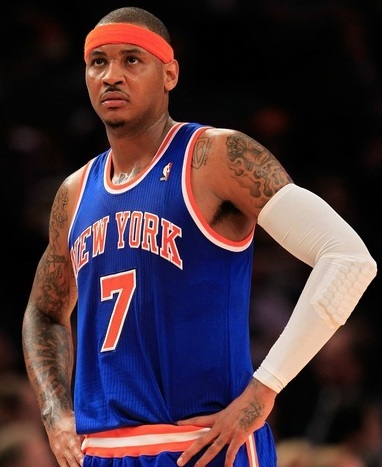 #2 Miami Heat vs. #7 New York Knicks: Over the course of his 9 year NBA career Carmelo Anthony has advanced out of the first round of the playoffs just once (in 2008-2009 with the Denver Nuggets). This year is definitely looking like more of the same for the man known as ‘Melo as this Knicks team just does not have the firepower to compete with defending Eastern Conference champions the Miami Heat. The top three for the Knicks of Carmelo Anthony, Amare Stoudemire and Tyson Chandler just are not even on the same level as Lebron James, Dwyane Wade and Chris Bosh and to make matters worse for the Knicks their point-guard Iman Shumpert also tore his left ACL and is out for the remainder of the playoffs. I’m not sure what the Knicks need to do if they want to compete, but this experiment of ‘Melo and Amare is not the answer. Likely another early exit for Melo. My prediction: Heat in Four. #3 Indiana Pacers vs. #6 Orlando Magic: The Magic won the season series against the Pacers 3-1, but that was when they had Dwight Howard in the paint. Howard, who has been the biggest seeker of attention in a league where everyone wants all eyes on them, is out for the playoffs recovering from season-ending back surgery. Somehow last night the Howard-less Magic were able to defeat the Pacers 81-77 in Indianapolis in game one last night, but I don’t expect them to be able to hang on for the series. The Magic needed an 11-0 unanswered run to close out the game to take the win and that is not something to count on every night. Without Howard, the Pacers have the better front-court and I feel that Danny Granger, David West and Roy Hibbert will just be too much for Glen Davis, Ryan Anderson, and Hedo Turkoglu to handle over the course of the series. This should be a highly contested series throughout though. My prediction: Pacers in 6. #4 Boston Celtics vs. #5 Atlanta Hawks: Besides the fact that I’m a Celtics fan, this series is my most anticipated series of the first round. It is a rematch of a 2008 postseason series that the Celtics were finally able to take in 7 games, holding off the young legs of the Hawks. Well four years later and both teams are still relatively similar to their old selves, and there should still remain plenty of animosity towards each other (particularly between Kevin Garnett and Zaza Pachulia). The Celtics took this regular season series 2-1 with the one loss being a 97-92 game April 20th in Atlanta in which the Big Three (Garnett, Paul Pierce and Ray Allen) did not play and also the most important player on this Celtics team sat out, Rajon Rondo. Ray Allen is still questionable for the early games in this series, but the other three should all be back and ready to go and the Hawks have injury troubles of their own as arguably their most dominant player Al Horford has been ruled out for the first round of the playoffs recovering from surgery to repair a torn left pectoral muscle. The saving grace for the Hawks is that they do have home-court advantage in this series, but I do have a strong feeling that the Celtics will be on top of their game over the next week and a half and take care of business and move on. My prediction: Celtics in Six. #1 San Antonio Spurs vs. #8 Utah Jazz:The Spurs have the oldest team in the National Basketball Association, but coach Gregg Popovich has been able to get the most out of his veterans this year and led them to a tie for best record in the NBA and the top seed in the west. Their 50-win season this year set a record for most consecutive 50-win seasons with 13, but this Spurs team wants the big prize and to win their first championship since 2007. During the regular season the Spurs were able to take 3 out of 4 from the Jazz and should be able to win this series rather easily. Tony Parker has been outstanding this season and put himself firmly in the MVP race and the well-rested Spurs should be too much for the younger Jazz, who has seven players who have even experienced a playoff game until this afternoon. For former Celtic forward Al Jefferson this is the first time he’s been in the playoffs since his rookie year in 2005 with Boston, and I am happy that he finally gets to experience the atmosphere of postseason games once again. 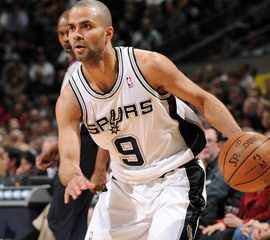 Tony Parker had another MVP type season. My prediction: Spurs in Five. #2 Oklahoma City Thunder vs. #7 Dallas Mavericks: The defending NBA Champion Dallas Mavericks took a step backwards this year and now face a tough matchup with Kevin Durant, Russell Westbrook, James Harden and company if they want a chance to defend their title. During the regular season the Thunder took the series 3-1 and their young legs may be too much for the Mavs to overcome. This series gives the Thunder a chance to show fans that they’ve arrived and if they manage to win this series it will give them a little payback for the Mavs knocking them out in the Western Conference Finals last year. The Mavericks will need huge showings from Dirk Nowitzki, Jason Terry, and Shawn Marion and Delonte West and Jason Kidd will have their hands full with the Thunder’s impressive guards. My prediction: Thunder in Six. #3 Los Angeles Lakers vs. #6 Denver Nuggets: This is a series that I am really looking forward to, if only to see how the Lakers will respond without Ron Artest (Metta World Peace as he wants to be known as now, but his elbow to the back of Harden’s head last Sunday wasn’t very peaceful). The Lakers took the regular season series 3-1 and should be able to take down the Nuggets, but the Nuggets did lead the NBA in scoring averaging 104 points per game which should keep this series interesting. Led by Ty Lawson, Aaron Afflalo, and Danilo Gallinari the Nuggets finished the season strong winning 8 of their last ten games so the fans in Colorado are hoping that they can continue playing this well against a top-quality opponent. We should know a lot more about how this series will play out in a couple hours, as the Lakers have won 27 straight series that they have taken game one, and I would expect that trend to continue if they are able to win this afternoon. My prediction: Lakers in Six. #4 Memphis vs. #5 Los Angeles Clippers: With the acquisition of Chris Paul and the development of Blake Griffin the Los Angeles Clippers are back in the playoffs for the first time since the 2005-2006 season. The Clips went 40-26 this season and Memphis finished one game above them at 41-25, making this as close as two teams can be matched as possible. In the regular season the Clippers won two out of three games, so Memphis must defend their home court if they want to advance to the semi-finals. Rudy Gay had another quality season for the Grizzlies and Marc Gasol is coming into his own, but I don’t think that this Grizzlies team has what it takes to overcome the 1,2 punch of CP3 and Blake Griffin. 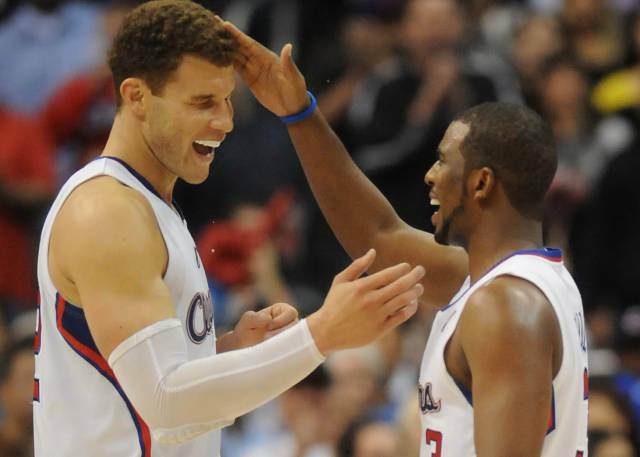 CP3 and Blake Griffin turned LA into "Lob City". My prediction: Clippers in Six. This entry was posted in NBA and tagged Basketball, NBA, Playoffs, Sports. Bookmark the permalink.